Rachel's Book Corner: The Five Mouse Brothers- recently released! The Five Mouse Brothers- recently released! 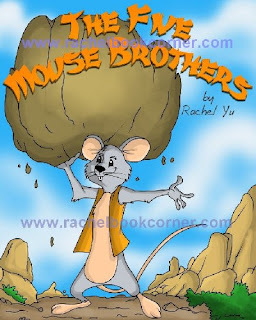 The highly anticipated, The Five Mouse Brothers, by Rachel Yu, is officially released today! This ebook is available at Amazon.com ($.99), BarnesandNoble.com ($.99), and in iBookstore. The Enhanced Version, with a Read-Aloud Audio Option; is only available on iPad ($1.99). One brother, falsely accused of thievery, must face the “Wheel of Doom.” What will they do to rescue him from his fate? Fortunately, an ingenious plan with the help of their family secret may just save the day. Join the mouse brothers on this fun and entertaining adventure, adapted from a classic Chinese folktale.